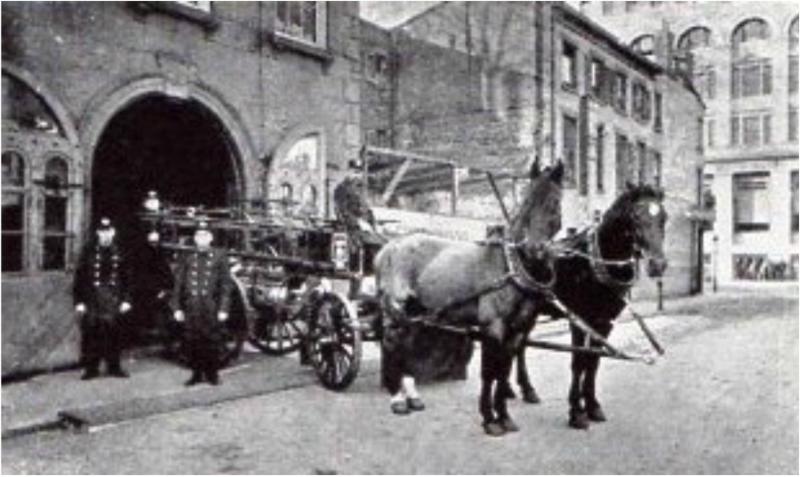 This firehouse at 10 Hotel Street (in 1894 renamed Hamilton Street) was built in 1842 to house Neptune Engine Company 2 (originally organized in 1820) of the Volunteer Fire Department. The house was on the west side of Hotel Street very near Market Street. 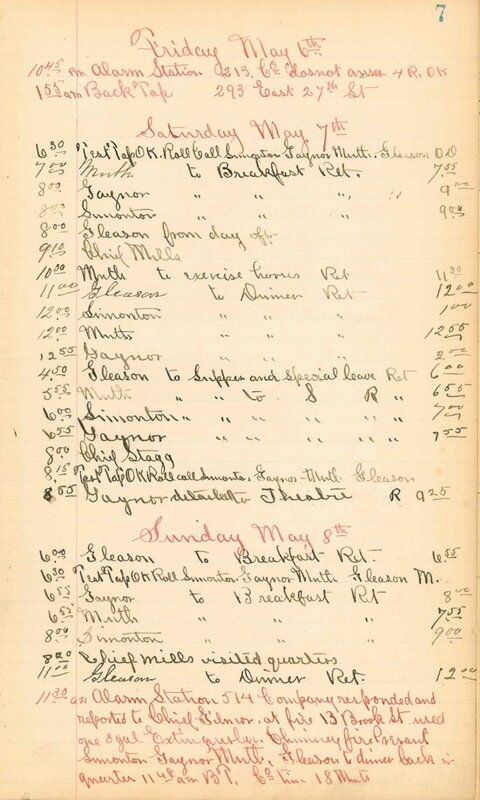 ​March 20, 1890: The transition from a totally volunteer department to partially paid "Call System" occurred and Neptune Engine Company Two became Engine Company 2. 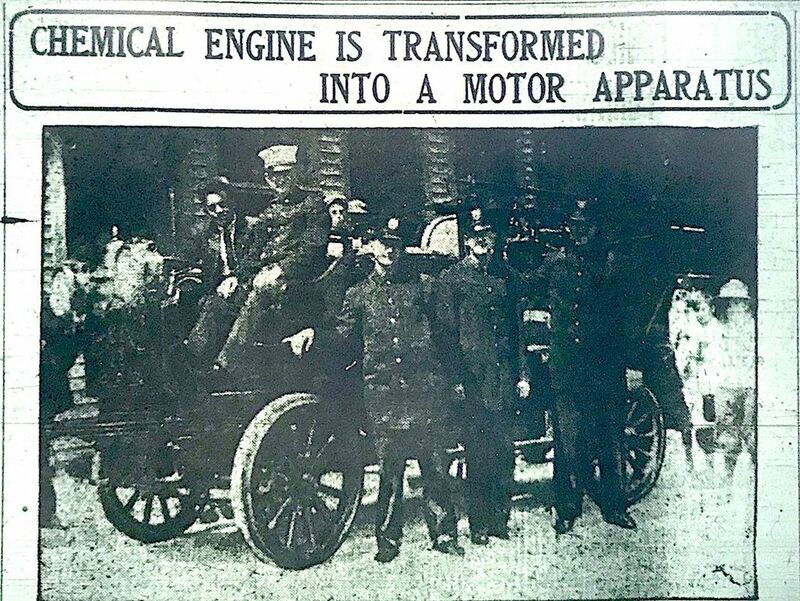 September 14, 1890: Engine Company 2 was transiently put out of service and Chemical Engine Company One entered service using a Babcock Chemical Engine with double 60 gallon tanks and 400' of hose. 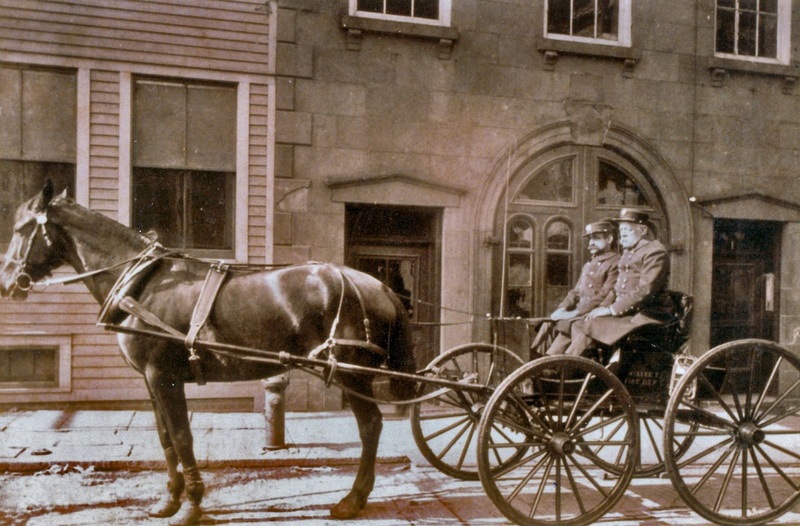 ​December 1, 1890: Engine Company 2 (with apparatus) relocated to the newly built Firehouse at 77 Highland Street. Chemical 1 remains at quarters. 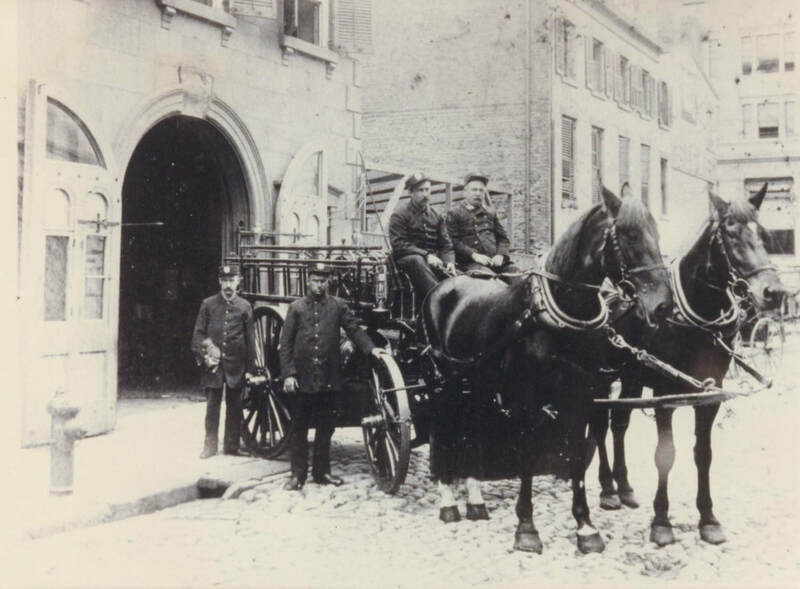 February 8, 1902: During the great conflagration when the entire downtown area was engulfed in flames, the entire eastern side of Hamilton street was lost but because of winds the firehouse was spared major damage. 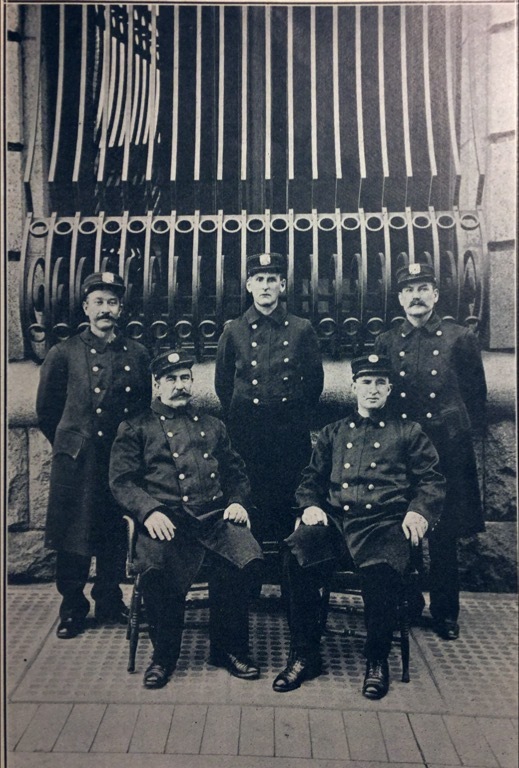 1908 photo of the men of Chemical Company: Standing: George Muth, Robert Giebelhausen, Martin Gleason. Sitting: Captain Charles Simonton, Lieutenant John Gaynor. 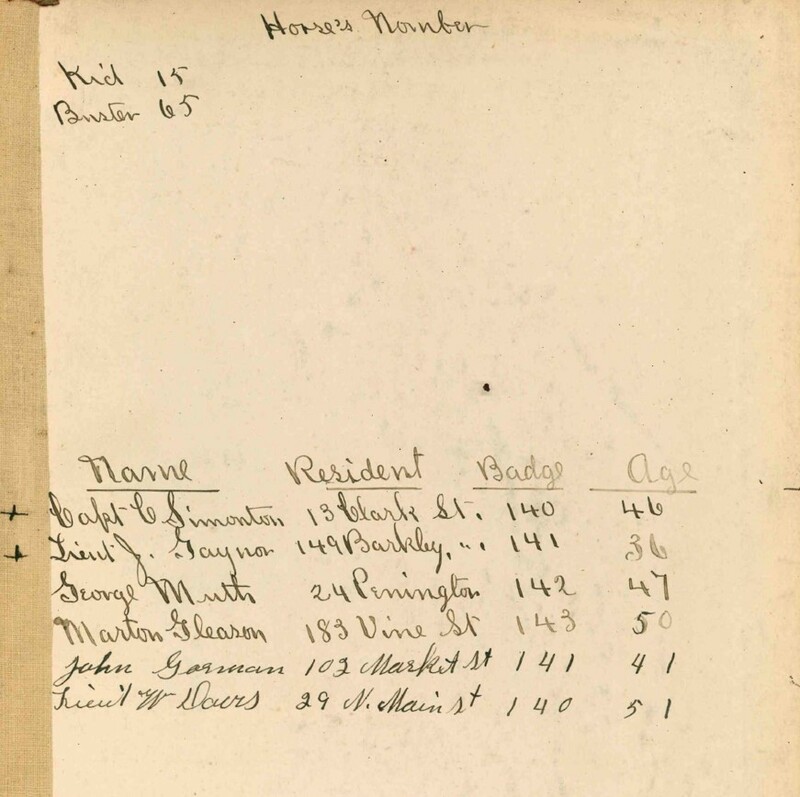 1910- 1911: Below are the April 1910 to June 1911 Company Journal and its inside cover page listing the roster with badge numbers and age of firefighters. Compared to other companies Chemical 1's roster was small. Note the names of the horses "Kid and Buster" as well as their numbers! August 23, 1910: Van Kirk lumbar yard fire: as often was the case the Chemical Company just stood fast. 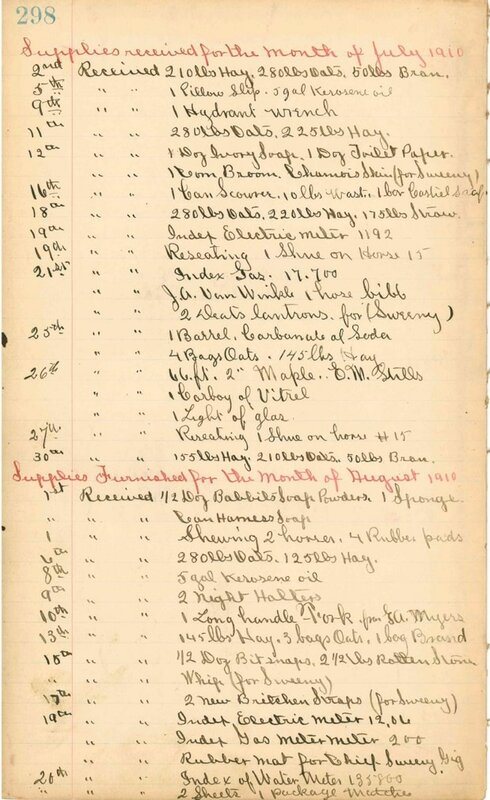 October 18, 1910: List of supplies received Note horse bibs, harness and 280 pounds of oats, 225 pounds of hay, "shewing" for 2 horses, barrel of carbonate of soda, package of matches, and a rubber mat for Chief Sweeney gig. 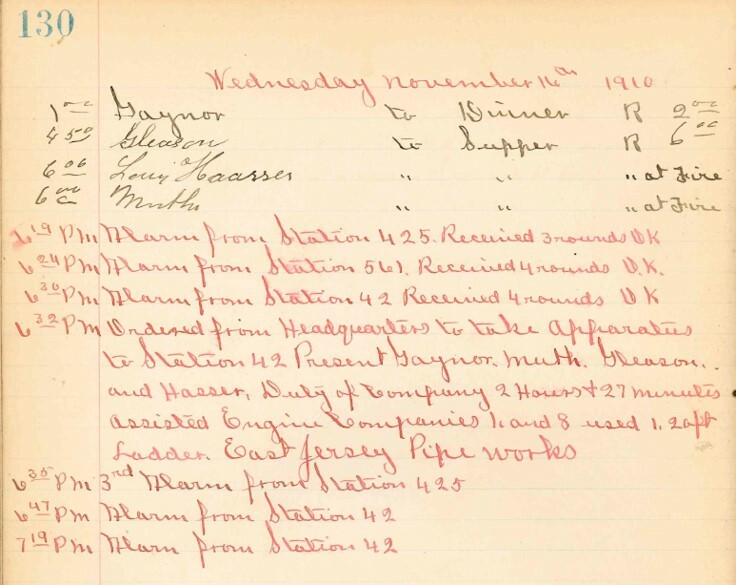 October 18, 1910: The new firehouse for the newly organized Engine Company 10 was about to open. 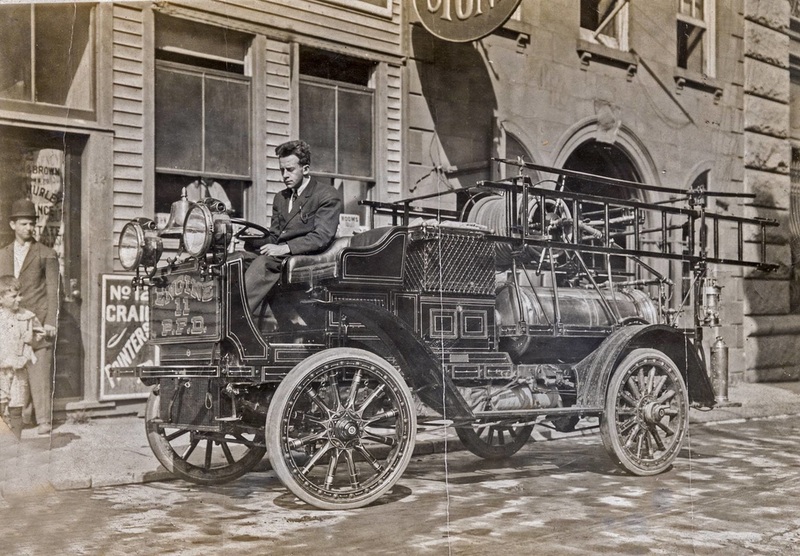 It was to house the first gasoline powered PFD apparatus, 1910 Howe Autocar Fire Engine. There was a major shifting of firemen to staff Engine 10. 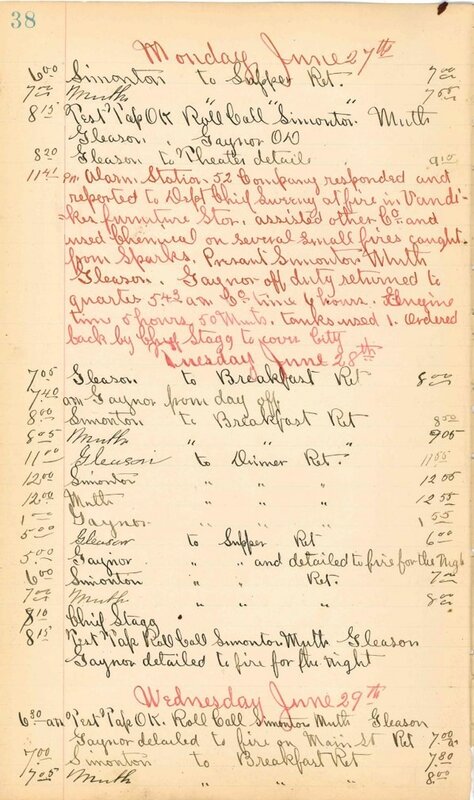 Note the journal entry below from Chief Stagg reassigning men (as soon as possible). Captain William Boyle of Engine 8 got the prestigious assignment to be the Captain of the new company and Chemical Captain Charles Simonton was reassigned to Engine 8. 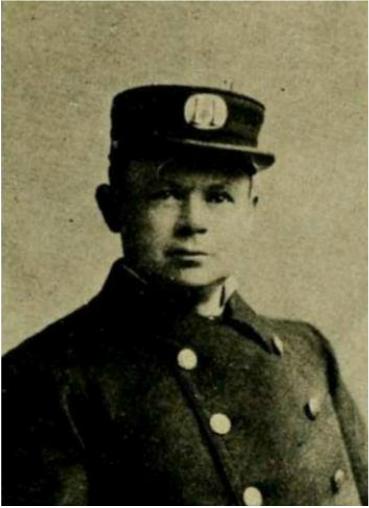 Lieutenant (and future Chief Engineer) Thomas Coyle was transferred from Engine 1 to 10. 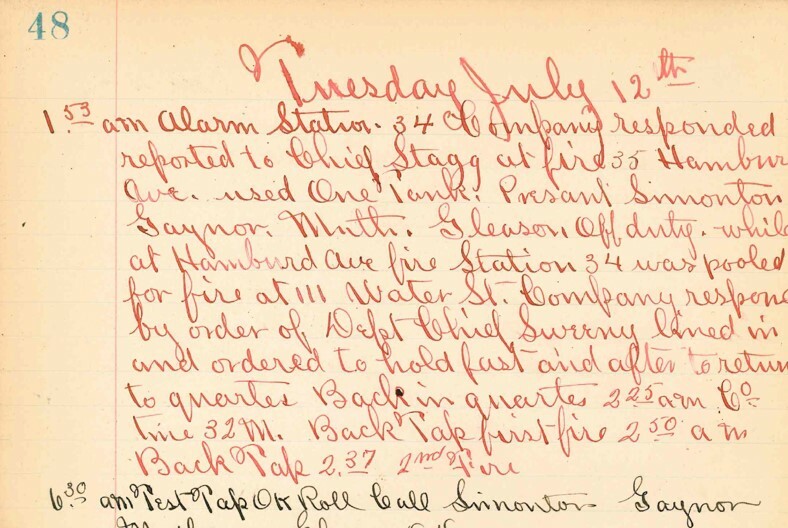 June 16, 1911: Chemical Company was ordered "off duty" by Chief Stagg and the apparatus was shipped to James Boyd of Philadelphia, PA. Journal entry is below. The components were rebuilt and motorized: with old equipment mounted on a Boyd auto-body chassis. It was marked as Engine Company 11 in anticipation of a relocation to a new Firehouse being built on Grand Street. 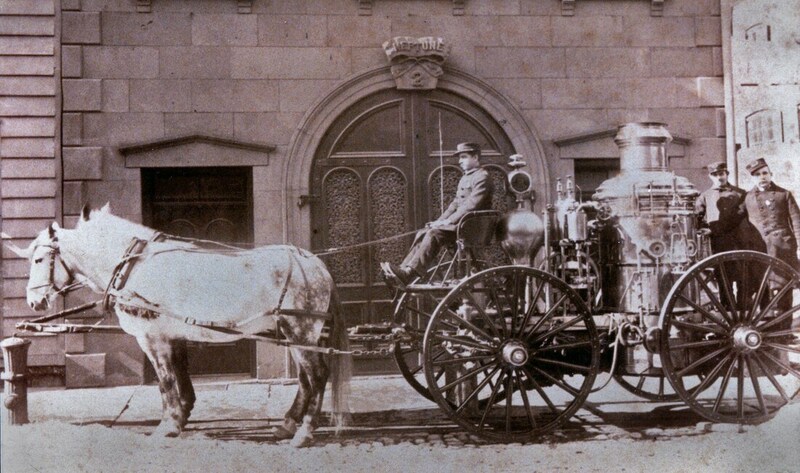 The apparatus is shown below at the factory and then after its return outside of the Hamilton Street Firehouse. Notice the crank below front grill. 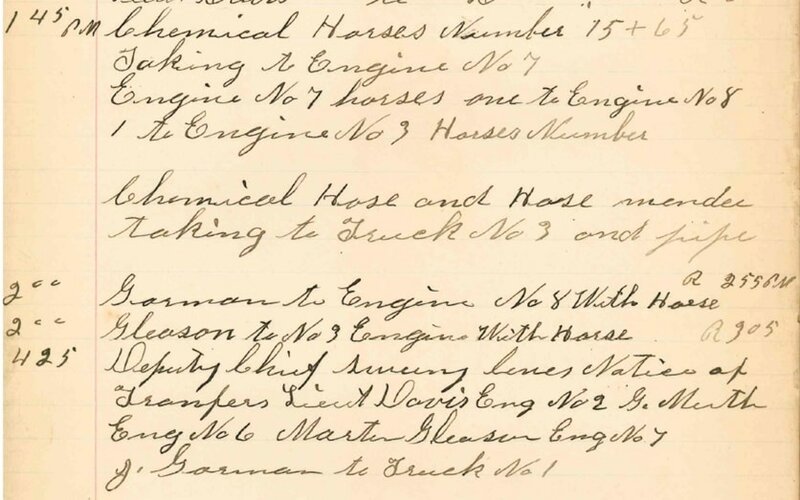 December 26, 1911: Delay in Engine Company 11 moving to new Grand Street Firehouse due to stalled delivery of chemical/hose wagons to Engine 1 and 5. A chemical company was needed in the downtown section of the city. 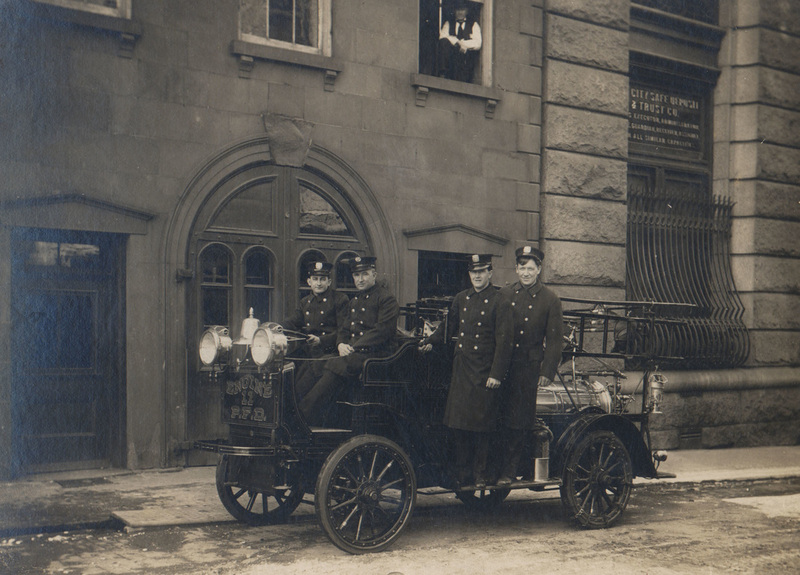 March 19, 1912: The apparatus relocated to the new "Stony Road" firehouse at 97 Grand Street where it continued service as Engine Company 11.